A rare and beautiful example of a large 18th century French monastery trestle table of massive solid oak construction. The top is formed of three giant planks that measure over 3 inches (8.5cm) in depth, supported by two substantial trestles and joined by a single oak stretcher. 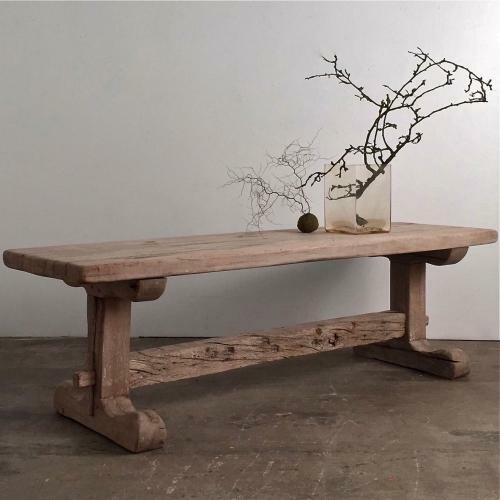 The pale oak colour and depth of patina on this table are truly exceptional, and set it apart from later 19th & 20th century trestle tables. This unique table will comfortably sit 8 to 10 people and is perfect for large family gatherings or formal entertaining. Tables of trestle construction created from massive boards of elm or oak, were the most common type of early dining table. The detachable tops and trestle legs allowed the tables to be easily removed after meals.